It was June 1995, and then-Capt. Scott O'Grady was tired, hungry and alone. A few days earlier, his F-16 Fighting Falcon was shot down over Bosnia, and he'd spent the last 48 hours or so on the move, evading Serbian paramilitary forces that were looking for him. He knew he was lucky to be alive - a Serbian ground-to-air missile battery had locked on to his F-16 as he flew a patrol to enforce a no-fly zone over Bosnia-Herzegovina. The first missile exploded between O'Grady and his wingman's planes, but a second one hit O'Grady's F-16 dead on, and the plane broke apart immediately. 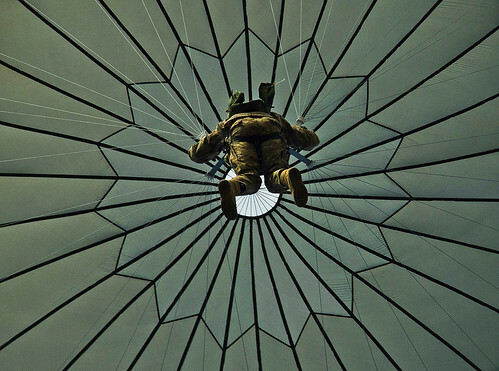 He was able to safely eject from the disintegrating plane and parachute to the ground. O'Grady's problems were far from over, though, as a group of Serbian paramilitary troops converged on his position. In his book, "Return With Honor," O'Grady recounts his ordeal and how he used his survival training to evade capture. He remembered that running usually led to capture, so he found a spot to hide and hunkered down until he was sure he was alone and then began moving during the night and sleeping and hiding during the day. O'Grady finally made radio contact with friendly forces and was rescued by a group of Marines that took him out of Bosnia at dawn of his sixth day on the run. "He survived on what he brought with him from home: lots of courage and training," said Adm. Leighton Smith, then the commander of NATO's Southern Command, during a press conference after O'Grady's rescue. "Whatever else he had, he had a lot of guts to go with it." What O'Grady also had were survival skills learned during a nearly three-week course at Fairchild Air Force Base, Wash. Called Survival, Evasion, Resistance, and Escape, or SERE, the course teaches aircrew members of every service how to survive on their own in any environment, should their plane go down. "Basically, we give them skills and tools they can use to build shelters, forage their own food and water and evade capture," said Senior Airman Joseph Collett, a SERE specialist. "They are just-in-case skills. We hope students never have to use them in real life, but if they do find themselves in a situation where they need them, they'll have them." In his book and in subsequent interviews, O'Grady often talks about how the training he received in SERE was invaluable, and he directly credited this training with saving his life. "One of the most important aspects of this training is teaching students how to survive a crash or aircraft incident," Collett said. "Once you get out of an aircraft, you have to know what to do." One part of the training puts students through a "dunker," a mock-up of a helicopter that simulates a water crash and teaches them how to get out of an aircraft that crashes into and submerges under water. Students have to be able to remove their safety restraints and find an exit point, all while blindfolded and having to feel their way out. "It's intense, but learning how to do this in a training setting could potentially save my life if it happens for real," said Airman 1st Class Michael Salvaggio, a SERE student who is training to become a SERE specialist. "You're going to be scared, cold, tired, hungry and dehydrated. And if you don't know what to do, you'll potentially die," said Airman 1st Class Tyler Gillespie, a SERE specialist. "So, it's our job to teach students what they need to know to stay alive and get back home." "Ultimately, the goal is to survive, elude capture and get rescued," Collett said. That isn't always a possibility, though, so SERE also teaches students what to do if they are captured. This part of the training focuses on the code of conduct and what instructors call "returning with honor." "We give students a taste of what to expect in captivity and teach them how to deal with it mentally and physically," Collett said. "For many of us, this is the first time we've ever been in situations like this," said 2nd Lt. Adam Corey, a SERE student from the 4th Fighter Wing at Seymour Johnson Air Force Base, N.C. "So, knowing that if I do find myself out in the middle of nowhere with just myself and a knife I can survive, that's pretty cool." Then, just like O'Grady, who did what he had to do to survive six days in the mountains of Bosnia, students who graduate from the SERE course can do their jobs knowing they now have the resources to get through any situation they may find themselves in. "That's why we're here," Collett said. "We're giving people the tools to turn a horrible, desperate situation into a survivable one."